When I was a child, we went on a family holiday to Berlin, where - alongside Checkpoint Charlie and the rest - one of the sights that had to be seen was Spandau gaol. You couldn't get up particularly close, but you could see the fortress, and in a way, the atmosphere that the place generated was stranger even than that of the Wall itself. Built to hold 600 criminals, Spandau by that stage was home to just one man: Rudolph Hess. His last two remaining companions, Albert Speer and Baldur von Schirach, had been released in 1966, when Hess was already 72-years-old. Formerly the Deputy Fuhrer and one of Hitler's oldest and most respected companions, he had been amongst the most powerful men in Germany, responsible for the organization and structure of the entire Nazi Party. Now he was alone, guarded on a monthly rotation (at a cost then estimated to be £100,000 per annum) by troops from America, Britain, France and - horror upon horror - the Soviet Union. He had been condemned to imprisonment for the rest of his natural life and, to the distaste of the civilized world, he was destined to serve the sentence in full. If his mind hadn't been unstable before, then the 21 years he spent in solitary confinement prior to his eventual suicide in 1987 would surely have tipped him over the edge. The fascination that this frail and fading relic of the Third Reich exerted on the public imagination dated from 10 May 1941. That was when a German parachutist landed in Scotland, announcing that he was Rudolph Hess and that he was come to negotiate a peace treaty between Germany and Britain. He was promptly imprisoned and, with the exception of the proceedings at Nuremberg, was never heard to speak in public again. What the hell motivated him to make that flight? Did he really think that he was in a position to negotiate on behalf of Hitler (who knew nothing of Hess's actions)? Or that Churchill would listen to him? Well, yes, it seems that that was exactly what he thought. The invasion of the Soviet Union was just six weeks away, and there is no doubt that a peace settlement with Britain might have made the difference on the Eastern front: with just the one war aim remaining, it is quite possible that Hitler could have destroyed Bolshevism. And since Hess shared the Nazi hatred of communism (the rage of Caliban at seeing his reflexion in the mirror?) and the belief that an Anglo-German accord was historically appropriate, what could be more agreeable than to get the loose ends tidied up before Barbarossa kicked in? Of course, the British propaganda machine lost no time in telling the population that Hess's flight to Scotland was evidence that the Nazi high command was falling apart at the seams. Similarly the German propaganda machine lost no time in suggesting that the man was mad. On balance, the latter interpretation of his actions seems more plausible. The motivation might have been an extension of the political thinking of Hess and of the Nazis more generally, but the implementation was the work of a man who had slipped off the beaten path. It didn't happen, of course. The Allies had no intention of inviting the surviving officials of the Nazi Party to form a new government. Instead Hess was dispatched to Spandau, where he rotted away in a twilight world of shadows and unreality. By the mid-1970s he was all that was left. There were still the annual Silly Season stories in the tabloids, claiming a sighting of Borman or Mengele, but we knew it was nonsense really and that the only surviving Nazi any normal person would have heard of was this one man in Spandau. And since public interest in the War was still high, books like these made for perfectly reasonable paperback publications. Eugene Bird was an American officer who served as Commandant of Spandau, and he tells a straightforward story that benefits from his insider testimony and from substantial quotes from Hess's own writings - letters, diaries &c. There's no hidden agenda, just the story of a fading figure who belonged in a black-and-white world. Hugh Thomas, on the other hand, is off on a different track altogether. 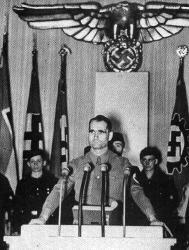 As a British Army surgeon who examined Hess, he is convinced that the man in Spandau was not, and never had been, Rudolph Hess. At the heart of his argument is the fact that the prisoner didn't have the scars that Thomas believes that Hess would have had, as a result of his World War I wounds. From that discrepancy, he goes on to examine a number of other facets of the case, and concludes that Hess had indeed intended to fly to Britain, but was shot down by the Luftwaffe, whereupon a lookalike was sent to complete the mission. Frankly, I don't believe it. I'm absolutely no expert at all on the subject, just an occasionally interested layperson, but if I were a member of a jury and Thomas were presenting his case that the Allies had the wrong man, I would not be convinced beyond reasonable doubt. This has less to do with the minutiae of the case, which I'm not qualified to address, than with the broad questions: If you're the Nazis and you don't want Hess negotiating with the British, then just shoot him down. Don't send a replacement. And if this was simply a double at Nuremberg, how bloody mad was he to believe that he was about to take over the country? Why didn't he try to get out of it? The subject, however, remains open, and the conspiracy theorists continue to argue the toss. Can't see mass-circulation paperback publishers getting too involved these days, though. PS I don't know which is the correct spelling of Hess' first name. I always thought it was with a 'ph', but Hugh Thomas seems quite certain that it was with an 'f'. Trivial PS A couple of years after Eugene Bird's book was published, The Tourists nicked its title to give Annie Lennox and that beardie bloke their first Top 40 single.